Miscellaneous | read. write. teach. I’m still fighting off the last vestiges of whatever nasty thing I came down with a few weeks back, and after overdoing it with some physical activity today (soccer game and a run), I’m feeling crappy again. And next Friday I will be at the wedding of one of my best friends, so I’ll be back with writing tips the first week of October. I took a picture of all the things from the box that I was going to put here, but it turned out blurry, and since my dog threw up all over my living room in the last few minutes AND gmail stopped downloading new attachments, I’m just going to use this one instead. 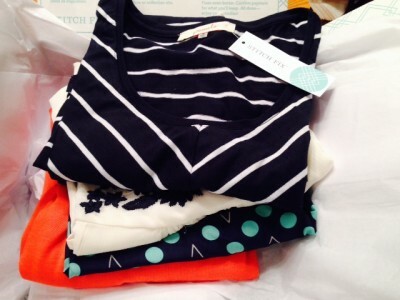 I got my second Stitch Fix box today. Technically I asked for it yesterday (my thirtieth birthday), but it came today, which is fine, since I was pretty busy yesterday. Today is the day FedEx estimated it arriving from the beginning, too, so I was prepared for the slight delay. 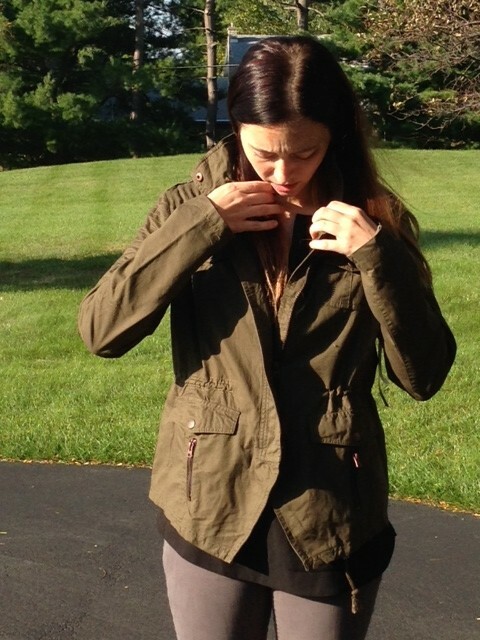 The clothes from my first Stitch Fix. I also got a purse, but I forgot to pull it out for this, then I was too lazy to reshoot. Those of you who have known me for a while know that I’ve never had much fashion sense. I’ve always valued comfort over cuteness, and for most of my life you were more likely to find me in jeans (or sweatpants!) and a t-shirt than anything else. But then I started teaching, and I realized I would have to look at least somewhat different than my students. Over the past few years I’ve slowly been upgrading my wardrobe, but I’ve pretty much stayed within my comfort zone. It’s gotten a bit stale, to say the least. It was time to try something new. I’d been hearing about Stitch Fix for a few months (though apparently I was still way behind the rest of the Internet), and after seeing some friends have positive experiences, I thought I’d give it a try. I figured I didn’t have much to lose. For those who, like me a few months ago, might be unfamiliar, the basic premise is this: you sign up for Stitch Fix, fill out an extensive style profile, set a date for your box to come, and you wait. While you’re waiting, a stylist goes through your profile (and your Pinterest style board, if you have one) and chooses five articles of clothing and accessories for you, puts together a handy style cheat sheet, and ships it to you. Then you try on the clothes in your own home, pairing them with your own wardrobe to see how they work, and you send back (free of charge) anything you don’t want. They charge you $20 for the box, but if you choose to keep anything, that money goes toward your order. You also give them feedback on what you liked and didn’t, and why you did and did not like those things, and they use that to improve your next fix, if you choose to get one. My first box came today. I was pretty excited for it, and also a bit nervous, but it turns out I had nothing to be nervous about. My stylist somehow understood the hodgepodge of information I’d given her and knew just what to send me. Some things I loved, some I didn’t. Some thing I would have picked out for myself, and others I would have passed over so far (and, perhaps not-so-strangely, the things I didn’t like were not the things I would have passed over). In the end, though, I can understand why she picked out each piece she did. I’ve never though of myself as having a style, but apparently I do, and she nailed it. I have a confession: this blog has never been what I wanted it to be. I’ve written irregularly, and the sporadic nature of the posts has, understandably, resulted in a low readership. Not seeing brag-worthy numbers in my Google Analytics account made me feel discouraged and resulted in my writing posts even less awesome. About a year and a half ago I decided it was time to do something to break out of the spiral. The problem, however, was that I wasn’t sure what that something was, and so I let the blog sit, only posting every month or two just to remind people that I was indeed still here. And then it finally hit: I was trying to do too much. I realized I’d come up with ideas for posts and then never write them because I was sure there was something more interesting, or more blog-worthy. I needed a focus. I’d been toying for a while with the idea of writing a teaching blog, but I didn’t like the idea of limiting myself that much, especially when I still identify as a writer who teaches rather than a teacher who writes. Can you see where this is going? I can’t believe it took me this long. My blog, which has only been kathrynhoughton.com up to this point, has now been reborn as read. write. teach. I’ve switched to a new theme, and I finally posted information about my freelance skill set. Next I’ll be tweaking and personalizing the design, and hopefully there will be some new content up before too long as well. I hope the few of you who stayed with me this far will continue to follow me as I transition to an exploration of all things language. I haven’t actually been paying a lot of attention to my Day Zero list since I started it (in December 2012), but after a random series of reminders, I took a look at it again a few weeks ago (I’m really not doing well), and decided it was time to start working toward some things again. And because I don’t believe in easing my way into things, I figured I’d start with one of the harder goals on the list: going a month without buying takeout. June, I thought, would be a perfect month. I’m not teaching so I have time to cook. My schedule is lax enough that I can easily plan it around meals. Also, June only has 30 days. I’ve made a few exceptions, though. I’ll eat the food on the above list if someone else purchases it for me, or if I’m invited out and it would socially unacceptable to sit there looking sad and hungry. Mostly, these exceptions are just so that my already-lacking social life doesn’t die completely during this month. Oh, and I’ve also made an exception for movie theater popcorn because, come on! To a lot of people maybe this doesn’t seem that hard, but it has been a challenge for me so far (and I’m not even halfway done!). I don’t grab burgers every day, but I eat probably more than my fair share of takeout, and I have a horrible soft spot for Auntie Anne’s Pretzels every time I go to the mall. But I did go through a phase in February and March, when I was moving and traveling, where it seemed that almost every meal was restaurant or takeout, and I swear I’m still feeling the after-effects of that (both health- and money-wise). So I’m hoping this will inspire me to cook more, and help me get back on the right track health-wise. It might be a bit early, but I’m tentatively calling this goal a success! My lease at Beacon Lake will be up at the end of March, and while I have the option of resigning—at a higher rent rate—I’ve spent a fair bit of time lately looking for something else. There are a variety of reasons I don’t want to return. Mostly, a lot of little issues have sort of coagulated into a larger dislike. First, I tried to buy a house. I figured I could afford a decently priced house since I’m doing just fine spending a decent amount on rent each month. But then the bank decided not to count a large chunk of my income, since, as I understood it, I’m in a risky profession. Anyone could lose their job at any time, but I guess it only really matters if you’re a professor. Also, despite the fact that I made a certain amount of money last year, the bank doesn’t agree that I’ll make anything near that this year. The bank said I can only afford $400/month in housing expenses. I’ve been thinking lately about this blog and how it functions. When I started it back 2009 (I actually had it before that, but someone hacked and infected my blog site), I had wanted it to be a blog of reading, writing, and popular culture. And while I said popular culture, I really wanted to talk a bit about issues important to me, such as politics, women’s rights, etc. But over the four years I’ve had the blog, I haven’t actually done much writing. There are posts here and there than I’m happy with, but mostly, it’s felt like an unwelcome commitment to me. The more I think about this, the more I realize it isn’t that I don’t want to blog, it’s that I’m unhappy without a clear blogging purpose. So my goal this year is to fix that, to find my purpose. That means I’ll be experimenting with what I post. I’d like to talk more about the reading I’m doing, but I’m also going to let myself write about different types of things (such as my teaching, or the hunt I’m on right now to find non-apartment housing, or the fact that I’ve started a second Day Zero Project). I’m also going to try to take and post more images. Basically, I’m going to try to turn this blog into something I’m happily committed to. My first order of business will be to do my annual year-end review in books—something I genuinely enjoy writing each year—but then, I’m going to sit back, relax, and try something new. Hopefully, after playing for a while, I’ll have a clear idea of what I want this space to be.